Many of our customers enter the Shoppe and immediately recognize Jean’s art work. They know it because they already own a piece of Jean’s art or their friends, neighbors or family members do. 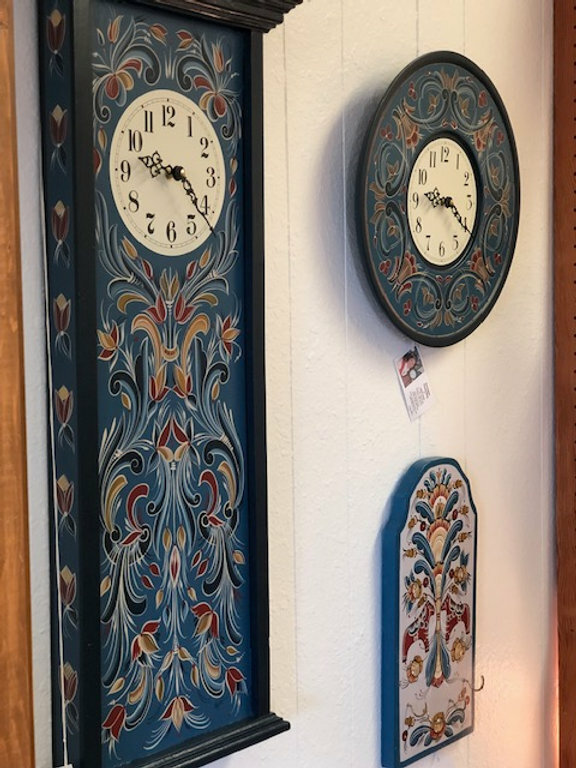 Jean has been a beloved artist in Northwestern Minnesota for over 40 years and we are so pleased to carry her traditional Scandinavian Rosemaling at the En Liten Svensk Shoppe. Jean’s work is especially impressive because she is primarily self-taught and she does much of the woodworking herself. She designs, builds and creates the pieces that ultimately become the canvas for her beautiful painting technique. Recently, we hosted a strolling demonstration at the Shoppe to showcase Jean’s talent and I spent some time chatting with her, admiring her ability to answer my questions and paint at the same time (the kind of focus that only comes from years of practice). 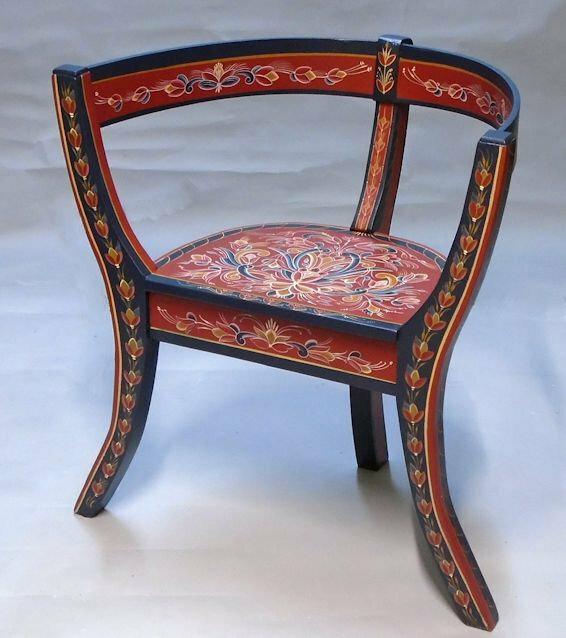 I asked Jean about her favorite part of the Rosemaling process and she said, “This… right now, it’s my favorite.” And what Jean was doing was the detail work, the intricate lines and scroll work that is a defining characteristic of the art form. Jean’s work has been showcased on Public Television as well periodicals and publications across the region. She is a mother and grandmother and lovingly shares stories about her trips to Fargo to see her grandchildren, spoiling them as only grandmas know how. 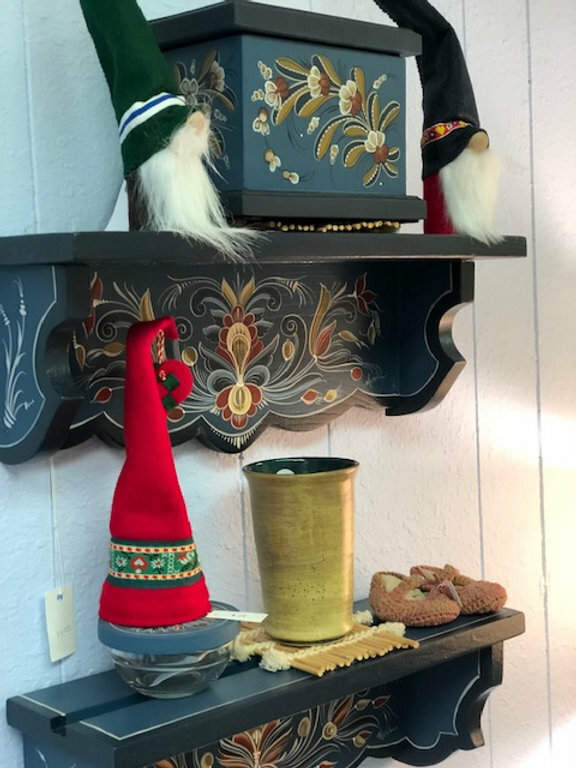 I asked Jean about how she got her start in Rosemaling and how her skills have progressed over the years. I asked Jean if she actually makes all of the wood pieces for her products and her response made me chuckle. She said, “When I show the finished pieces to people, they think my husband made the furniture. I do set them straight.” Jean has a woodworking shop connected to her garage and she loves the process of building the wood pieces. 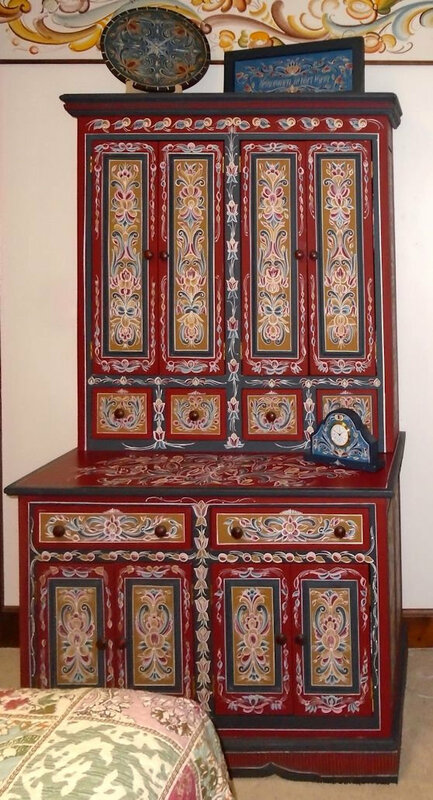 Currently, Jean has been building and Rosemaling large pieces of furniture for her home. She’s wanted to create the pieces for years and decided that if she was going to build them herself, she wanted to do it now as her children are all grown and she has the extra time. 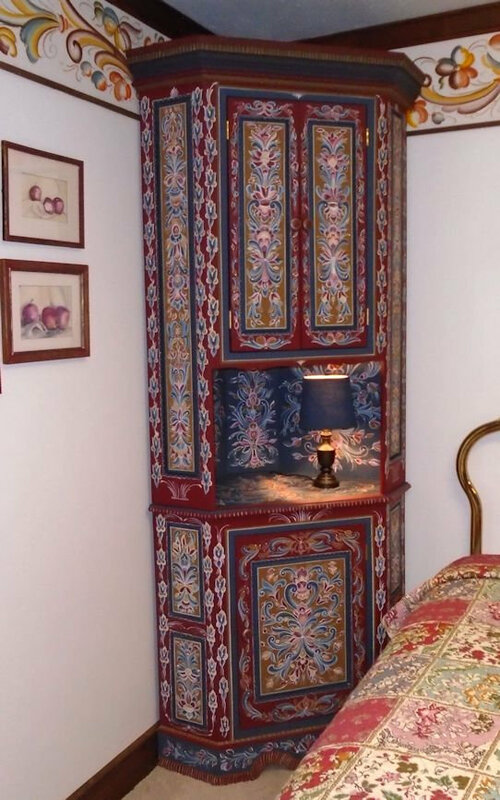 I asked Jean if there’s a favorite piece she’s created and she shared a photo of the large corner cupboard she has in her guest room. It is absolutely incredible!